This project has installed a high-resolution video camera in the nose cone of the autonomous underwater vehicle (AUV) named Dorado. The purpose is to conduct transects of the deep water in the Monterey Bay to identify the types and quantities of marine life that live there. Transects are a fundamental scientific tool for estimating the abundance of biological populations, and in this case, the transects are conducted at depths from 50 meters to 1,000 meters deep in 50-meter steps. Each transect run by the AUV is 100 meters long, and at the end of the mission all of the organisms that can be identified in the video images are cataloged and counted. In this way scientists gain an understanding of Monterey Bay’s midwater environment, a region known as the mesopelagic zone. 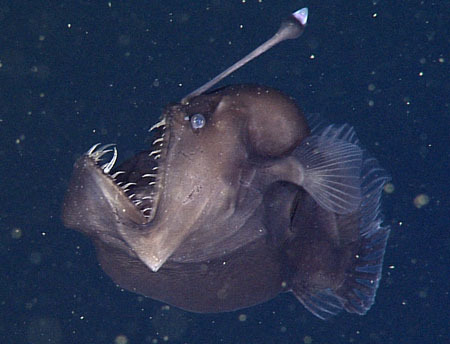 Midwater transects have been routinely conducted at MBARI using remotely operated vehicles (ROV) with cameras that are controlled by operators from a surface ship for over 20 years. 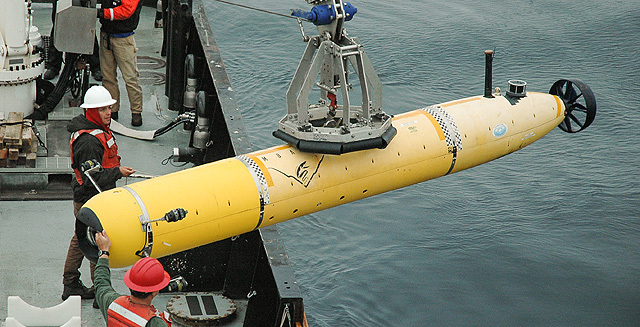 By showing that the AUV can effectively perform this routine work autonomously, the surface ship is free to be used for other tasks. The AUV transects may also do a better job of identifying organisms that are influenced by the noise of the ROV and work is currently being conducted comparing the results of these two methods. The camera system is currently rated for depths of up to 1,500 meters. Nov 14, 2016 - A new MBARI robot will add to the midwater observations researchers have been making with remotely operated vehicles (ROVs) for nearly two decades.